Facing a busy end-of-year schedule and a particularly intense first week in space, two cosmonauts and a NASA shuttle veteran geared up Monday for launch early Tuesday aboard a Russian Soyuz spacecraft for two-day flight to the International Space Station. Joining them will be 32 medaka fish, bound for a zero-gravity research aquarium aboard the lab complex. 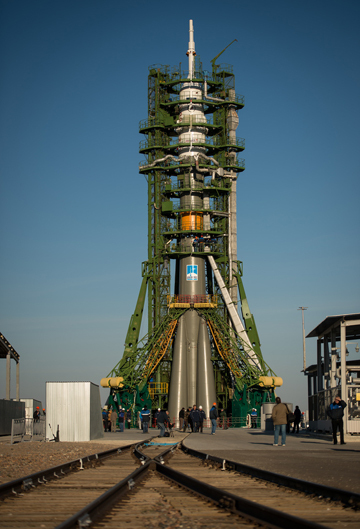 The workhorse Russian launcher was targeted for liftoff from Site 31 at the Baikonur Cosmodrome in Kazakhstan at 6:51:11 a.m. EDT (GMT-4; 4:51:11 p.m. local time) Tuesday, roughly the moment Earth's rotation carries the pad into the plane of the space station's orbit. It is the first manned launch from Site 31 since July 1984 when the Soyuz T-12 spacecraft carried three cosmonauts to the Russian Salyut 7 space station. Soyuz TMA-06M commander Oleg Novitskiy will monitor the automated nine-minute ascent from the center seat of the spacecraft's command module, flanked on the left by flight engineer Evgeny Tarelkin and on the right by NASA astronaut Kevin Ford. Novitskiy and Tarelkin are making their first space flights while Ford piloted a space shuttle during a 2009 flight to the space station. "Of course, we are very scared! But the State Commission said today we have no way back," Novitskiy, speaking through a translator, joked at a pre-launch news conference. "But seriously speaking, it's an absolutely new sensation because we are all pilots and it will be different. We will need to fly into outer space, and I think it will be an unforgettable feeling." Tarelkin said any "normal person would be nervous before such a launch." "But I think that you know (the) difference between a brave person and a coward," he said. "A coward is scared and he will never do anything. But a brave person can be nervous, can have other difficult feelings, but he will do what he wants to do. That is why we have no problems at all. We're looking forward to the flight." If all goes well, Novitskiy will oversee an automated approach to a port on the station's upper Poisk module, docking around 8:35 a.m. Thursday. Space station managers typically schedule light duty when a new crew arrives to give them a chance to learn the ropes and familiarize themselves with station systems and procedures. But this time around, the new comers will have to hit the deck running. Four days after Dragon's departure, Williams and Hoshide plan to carry out a complex spacewalk Nov. 1 to fix a leak in the coolant system of the station's far left-side solar array. The system circulates ammonia through a large radiator to dissipate heat, and if the leak isn't resolved soon, the station could lose one of its power channels. "The tasks just kind of fall into a place where they need to be," Ford said of the crew's schedule. "We need to take care of our problem outside, so that's why we'll have to get the spacewalk in, and of course, the Dragon is on board and needs to come home on time as well. "My organization back home has done a lot to prepare me for it. One of the things they did was send Joe Acaba back to Star City a little early to give me a really good handover brief, which doesn't usually happen." In a preflight interview, Ford told CBS News he was looking forward to comparing the experience of launching aboard a shuttle and the much smaller Soyuz. While the Russian spacecraft is cramped compared to the space shuttle, Ford said it is a marvel of sound engineering. "I was really impressed with the design features built into (the Soyuz), the way the escape system works, how that's all activated, the way anywhere in the launch sequence there are different modes that get you back safely to the ground," Ford said. "The fact that the spacecraft is small is due to the fact that it's just delivering people, it wasn't meant to be a space truck, it was just meant to be a space taxi for three humans. So really, the design is brilliant. What they put together all those years ago is still working well today." Ford and his crewmates will spend two days on their own, executing a series of rocket firings to close in on the International Space Station. Unlike many astronauts and cosmonauts who view two days aboard the Soyuz as an uncomfortable necessity, Ford said he planned to enjoy the ride. "I think it's going to be cool," he said. "That appeals to me. Don't you think it would be cool to be in a minivan in space? I know you're cooped up and everything, but there's room to stretch out and you don't have to be right up against each other or anything. Just the cool factor of being in a little spacecraft is going to be really fun for me for a couple of days. I'm really looking forward to it." Once past the initial rush of activity aboard the station, Ford and his Russian crewmates will settle in as members of Expedition 33, focusing on station maintenance and science operations. One of the early highlights of the mission will be the transfer of 32 medaka fish from the Soyuz to a high-tech aquatic habitat delivered by a Japanese cargo ship earlier this year. The fish will be studied to learn more about the effects of space radiation and the absence of gravity, research that could shed light on the mechanisms behind osteoporosis and development of potential countermeasures. Williams, Hoshide and Malenchenko are scheduled to return to Earth aboard the Soyuz TMA-05M spacecraft on Nov. 12, closing out Expedition 33. Ford, Novitskiy and Tarelkin then will form the nucleus of the Expedition 34 crew, with Ford taking over as commander. With station assembly virtually complete -- a Russian laboratory module is scheduled for launch late next year -- research is the prime goal for NASA. Ford said he did not feel any undue pressure to produce results, but he acknowledged a need to let taxpayers know what they're getting for their money. "Not everybody has their eyes on what we're doing in space," he said. "When I watch the evening news and read the papers and magazines, there's a lot of things for the population to focus on. I'm obviously in the camp that thinks taking a little bit of your extra money and investing in your future is really a wonderful thing to do, whether you're a family or whether you're a planet. "If people just look through the list of all the things that we're doing up there, I think they'd say it's a great thing. We can always argue about the price tag, I guess, but nobody else is doing it and I think somebody needs to. ... What they're doing on board far exceeds what I thought they were doing. The task is to get the word out to the people about what we're doing up there." But that doesn't mean he won't enjoy the unfamiliar luxury, for a shuttle pilot at least, of having a bit of free time to enjoy the experience of long-duration spaceflight. "It's the nature of a shuttle flight that you're very busy, you don't take a lot of time for exercise and really even meals and stuff because you have so much to get done during the docked portion," he said. "But this time, it's all about living on board and having, hopefully, some free days, some Sundays off, where I can go out and see the planet."